Karlsruhe, Germany, October 30th, 2014 – EIZO GmbH announced the release of the RadiForce EX270W, a 27-inch monitor for operating rooms (hereafter OR) with an innovative modular design. As modern medical technology helps increase the efficiency and effectiveness of surgical procedures, cost-effective integration into the operating theater and the broader environment opens additional opportunities to improve patient outcomes. The RadiForce EX270W was specifically designed not only to meet the demands of the operating room environment, but to evolve with the dynamic pace of medical technology. The 1080p (Full HD) monitor is the latest addition to EIZO’s line of OR solutions, which includes video management solutions for integrating a wide range of imaging inputs and transmission technology for getting the images to wherever they are needed. From its inception, the RadiForce EX270W was designed as a modular monitor to support targeted connectivity and the ability to evolve to changing technology demands. Outfitting the monitor with input modules tailored to the individual application not only optimizes material costs, it reduces cable clutter and the overall physical footprint, simplifies system design and makes maintenance more manageable, even in the most complex systems. The modular concept supports reduced stocking volume with even better system uptime as the same modules can be reused with different monitors and even future models. It not only allows the integration of legacy systems, the future focused design enables the monitor to evolve with changing system and technology demands. Mechanically, the RadiForce EX270W boasts a slim design and low weight, saving precious space in the OR or on a mobile medical equipment tower. The frame cover secures the non-reflective safety glass, while the rounded edges support physical safety and allow adjacent mounting while minimizing light ingress from behind. The rear cover is formed with flowing angles to accentuate the slender impression while achieving high stability, supporting heat dissipation and preventing fluid entry. In the course of development, EIZO worked with Germany’s renowned Fraunhofer Institute to test and validate multiple configurations of the sleek, fully-encapsulated housing up to an IP65 protection rating in accordance with EN 60529. With IPS technology and an exceptionally bright, 600 cd/m2 white LED backlight, the RadiForce EX270W ensures sharp image reproduction and a clear view from almost any perspective within the OR. The monitor functionality has been streamlined to focus on high-quality image reproduction and critical functions for adapting the image to the local environment. The RadiForce EX270W is calibrated in the factory to offer five internal lookup tables (LUTs) that are optimized for a wide range of image sources and varying brightness conditions. In conjunction with the built-in horizontal and vertical mirroring capabilities, a few OSD settings through the PCAP (Projected Capacitive) keypad allow the monitor to be optimized to almost any installation site within seconds. 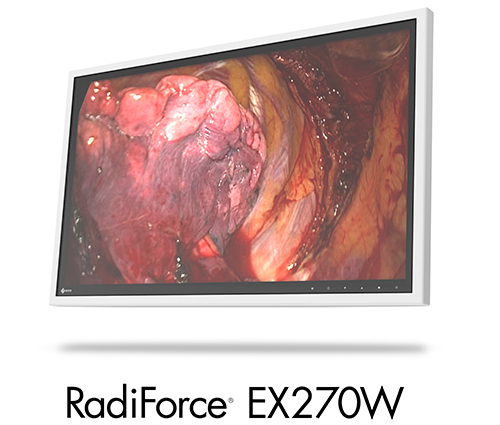 The RadiForce EX270W is now available and the new monitor has already been installed into a number of operating rooms. Availability may vary by country, so please contact the EIZO group company or distributor in your country for details. Visitors to Medica 2014 in Düsseldorf, Germany will be able to see the new product at the EIZO booth, Hall 10, #H41 from November 12-15. EIZO GmbH is based in Karlsruhe, Germany and is a leading manufacturer of visual display solutions for medical imaging applications. The company portfolio includes color and grayscale monitors of 1 to 8 megapixels, image management systems, and accessories. EIZO GmbH is a subsidiary of EIZO Corporation, a global leader in the manufacture of high end monitors for medical and graphic design applications, financial trading, and other markets. EIZO and RadiForce are registered trademarks of EIZO Corporation. Copyright © 2014 EIZO GmbH. All rights reserved.